Although I could draw well and thought I could jump right into inpainting when I first started in restoration, I was wrong. It took me months to be able to do anything easily as far as inpainting and finishing went. Today I find it the most enjoyable part of the job and find I can do a lot more with a lot less. I learned the basics of inpainting with modern materials – PVAC(AYAB) – from Gustav Berger in the 1980’s and I highly recommend his detailed and informative book Conservation of Paintings, Research and Innovations, available from Talas. Also note the 2010 ICON Paintings Group publication Mixing and Matching, Approaches to Retouching Paintings – especially the chapter by Sarah Cove of London on Retouching with a PVA Resin Medium. Sarah Cove has written an excellent article on the benefits of this inpainting system. My preferred fill is Mowiol based, a polyvinyl alcohol resin from Hoechst Chemical as a water soluble binder for whiting to make my gesso fills. See Diane Falvey’s article on Mowiol as a binder: The Advantages of Mowiol (polyvinyl alcohol): Comparative studies of organic and synthetic binding media for fillers on canvas. In: ICOM Committee for Conservation, 6th Triennial Meeting, Ottawa, 1981. It is a synthetic watercolor binder. You can experiment with the amount you need and make your fills behave depending on the painting’s needs. 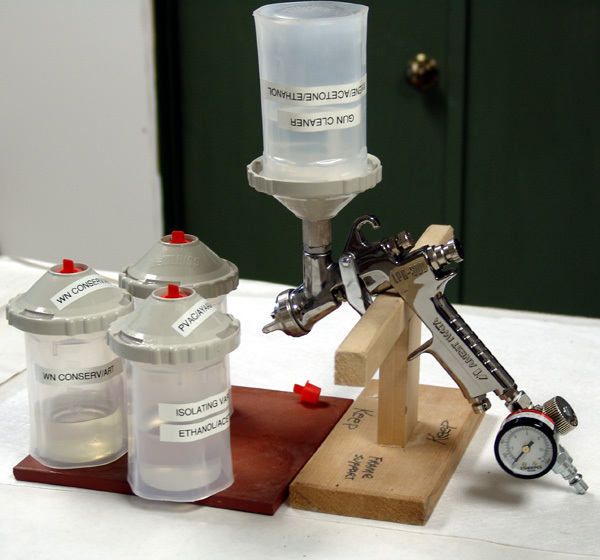 It remains soluble in water after drying so is easy to remove, or reform and reuse in the future. Mowiol bound gesso can be carved, shaped or burnished flat with your finger depending on the application and the amount of resin used in the fill. It can also be applied with a paintbrush if this is your preference. I tend to use smaller sized palette knives. You can make up a number of shades of gesso fill to keep on hand and re-activate them with water as necessary. I use powdered pigments to tint the gesso as I am mixing it up from scratch. Fill to match the original ground color although sometimes a bright white will be necessary in a sky or highlight. Seal the fill when dry with a thinned sealing application of PVAC (AYAA/AYAC) and a small brush. Filling is the really hard part and it’s good to get that out of the way. The fill should be exact and perfect as the basis for good inpainting. My preferred medium is PVAC(AYAB) thinned in ethanol/isopropanol with a little touch of acetone. 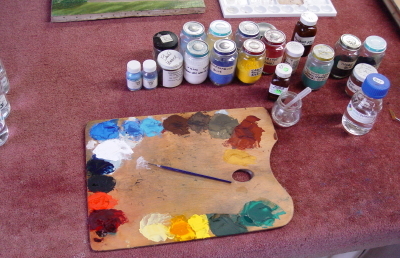 I mix up powdered pigments on my palette and bind them with the AYAB solution thinned in ethanol – enough binder to keep them on my palette but I paint basically using a watercolor technique and want to keep the colors thin. Too much binding medium makes for visible hot spots on the painting’s surface bringing attention to the losses. Inpaint very thinly and let the varnish layers even out the gloss. Basically you need a transparent and an opaque version of all the rainbow colors in order to color match because you are not just matching hues. The transparency is also critically important. Many colors can only be matched by laying down an opaque under coat and then glazing or cross hatching over it when dry with a transparent second color. I like the wooden palette because of the feel of the wood and the middletone color. It is difficult to stare at a bright white background to your colors and and then switch your gaze to your painting which is decidedly not white. I’ve been told by photographers that the palette should really be a neutral “photo” gray for best color matching, but the wood works fine. I judge my colors while wet in the first instant of applying them to the fills and then make my adjustments immediately as necessary – too warm, too cool, too, too transparent or just right. Lots of different blues are necessary because of metamerism – they are the hardest to match in different lights. Dragon’s Tongue 100% Tajmir Kolinsky from Cheap Joe’s #s 1 and 2s are good. 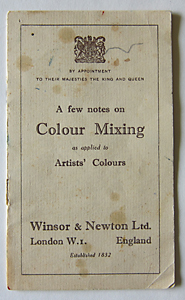 Similar versions available from Winsor&Newton and others. We have a lot of northern light and this very diffuse light is the best. If you get the light intensity too high your pupils will close and you will not be able to do much because you can’t see anything very well. The lighting takes practice. There are many good color balanced indoor lights available now. 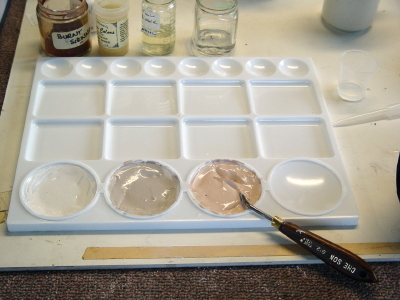 Three unique colors that I could not inpaint without, especially when working with 19th C. paintings, are Raw Umber Greenish from Kremer #40630, Kessel Earth from Maimeri, and Brown Madder Alizerine from Maimeri. The greenish Raw Umber was used a lot in the 19th C and was the background base for many 19th C. American portraits. It is very difficult to match if you do not have it on your palette. This Raw Umber also has a lot of other uses when toning other colors down or making greenish gray shadows in white drapery. Kessel Earth from Maimeri is the darkest of darks I can find anywhere (or used to be – they may have changed the formula). I augment the palette with many Maimeri Colors but just for the darks – the blacks, browns, Kessel earth and Brown Madder Alizarin. They are smooth clear colors that are easy to work with. I make a mixture of ethanol, isopropanol and add a small amount of acetone to get a fluid mix to work my colors and inpaint. The mixture is not toxic to be around and gives you a good amount of working time but still dries fast. A real breakthrough was discovering that dotting and crosshatching my colors allowed the loss to disappear much faster and with less paint than trying to work to an exact color match in one color. I have also learned to not try to color match with only one shot at it. I always lay down a base and then glaze over the initial intoning. Apply the right color fill and then a color that is close to the surrounding original paint as your first step and then cross hatch over it to do the color matching. By just trying to get close at first you end up getting a lot of work done that does not have to be removed. Another breakthrough is to learn to take your work off, even if you have hours into it – try it sometime. If nothing seems to be working it probably isn’t and never will- so go ahead and wipe it off and start over again, you will feel better and be much farther ahead in the long run. I usually used the Modestini varnishing technique in conjunction with inpainting and finishing. This method uses alternating layers of brushed Talens Rembrandt Retouching Varnish (Laropal K 80 in white spirit) or other similar mineral spirits based varnishes, alternating with a thin spray PVAC(AYAA/AYAC) isolating varnish. The spray allows you to put another layer of brush varnish on without disturbing underlying layers, and also will even out the surface. It has many advantages. On some very large inpainting jobs the painting is sprayed part way through with B72 which locks in all the fill and toning layers on the losses prior to final color matching. My final varnish is just about always a B72 sprayed on. I matte it down when necessary with microwax 445 from Talas and make it semi-matte for many paintings. Other choices for the final matte or semi-matte varnish varnish are available from Talas and can be applied easily on top of the B72. Ultramarine at the top, toning down through Cobalt to a mixture of Cobalt and Vermilion near the horizon. Greens in the shadows are actually best made by mixing black and yellow. “For greens in shadow there is no need of blue; they may be formed of a mixture of black and different yellows: the olive-toned greens thus produced are soft and very harmonious for shadows. Should you wish the tint to partake of a light grayish cast (as in the case of willows in shadow), use Black, Naples Yellow, and White. If a yellow reddish tint be needed for these dull greens, let the yellow predominate; but if the verdant part you are painting be now so far back in the prespective, that the violet gray-blue tint, peculiar to the distances, begins to take an aerial tone, then use French Blue. The greens which French Blue would give, when mixed with Naples Yellow, or with Yellow Ochre, break and are subdued by the use of Madder Lake, or sometimes by Light Red; more or less White being mixed with it, where it is required to gain an atmospheric tint. White Material- White, Naples Yellow and Burnt Umber. Raw Sienna and Burnt Umber in the depths. Black Material- Blue Black and Purple Madder. White, French Blue and Brown Madder for the high lights. Deepest Blacks- Ivory Black + Prussian Blue. Acrylics can be very helpful for some paintings, murals, etc. Liquitex makes a medium viscosity concentrated artist color that is very nice to inpaint with – sold in small 59ml bottles. When using acrylics I put my paint on a wet paper towel in a tin box with a lid. This keeps the colors from drying out and can even keep a palette overnight if you keep the towel wet. A lot of the problems with color matching are actually with the fill not the color. Shadows can be a real problem and cannot be eliminated by inpainting. You have to learn what you are looking at and this takes practice. You can add small amounts of texture after inpainting in some cases by applying small dots or strokes of acrylic medium to the loss and then building a texture – it does not take much acrylic. Colored pencils lightly used can be helpful at times. A method of spraying varnish is essential in the use of the Modestini varnishing technique and in applying final finishing varnishes. It would be impossible to apply an alcohol based varnish without the use of a fine spray gun and it would also be impossible to get a perfect finish on many paintings without a high quality spray unit. 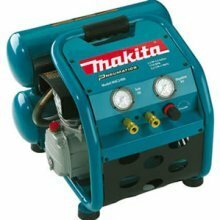 I am very happy with my new HVLP gun and the Makita air pressure system we recently purchased. After research I chose an Anest Iwata LPH300LV HVLP gun, 3/4 size that produces a fine adjustable mist with little over spray, a real gem of a find. Autobody finisher suppliers deal with Anest Iwata and you can find the products there. A new system came out in 2009 that allows you to use lidded detachable plastic containers that bayonet mount to your gun, so you can easily spray different varnishes without having to deal with cleaning the metal varnish container attached to the gun every time you switch varnishes. 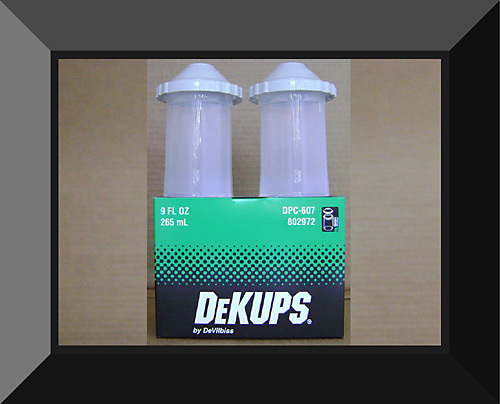 I store my varnishes made up and ready to spray in these DeKups and they make the whole system very easy to use, with little mess. Mixing and Matching ICON Paintings Group– See article by Sarah Cove on PVA inpainting. Talas – Professional Archival, Bookbinding, Conservation and Restoration Supplies – see page on Varnishes & Resins that are in use today by conservators.